I’m always getting told that my World of Logs posts are long and boring, and the only people who would make sense of them are people who don’t need to be reading World of Logs tutorials anyway. Yes, yes, no one ever words it quite like that. THATS STILL WHAT IT MEANS. So I am going to try again. And for intermediate WoL users, those of you who pull up CD graphs but aren’t too sure what you’re looking at, you guys can scroll down to the last section. There we are sipping tea and calmly discussing Megaera rampage CD usage. 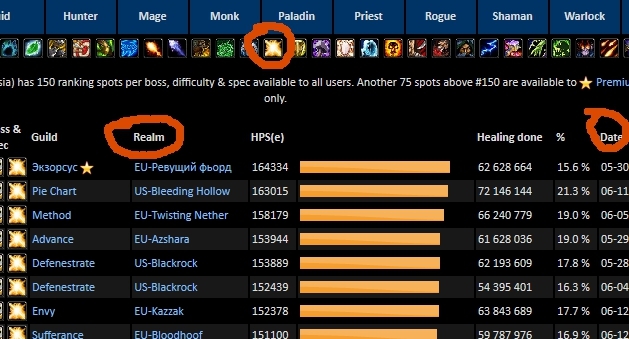 5) Select the little Holy icon under “Paladin” and choose a recent log from a paladin on server where you understand the language. I’m sure Афиа is amazing, but deciphering his or her spell names just won’t be worth the trouble. You want to go with a recent log too, as fight mechanics and class intricacies change over time. The more recent the log, the more likely it’ll give you an accurate representation of that fight for your class. 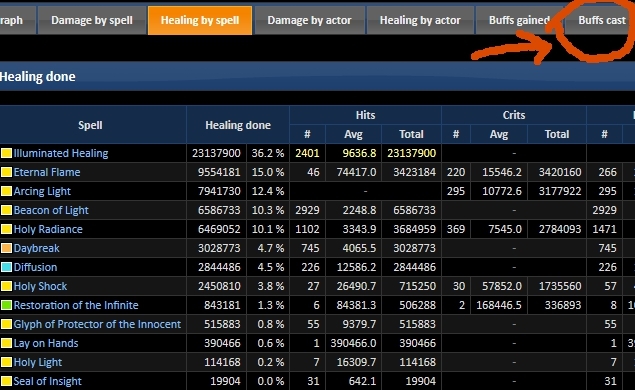 6) Click on a Paladin’s name, and check out their spell breakdown tab before hitting the “Buffs Cast” tab. I’m not sure what general etiquette is for using screenshot’s of a stranger’s logs. To give credit where credit is due, these are Aladya’s (from Method) logs from June 5. I picked these particular ones because the CD timing on them is perfect for teaching. If it’s inappropriate for me to use them, I will take them down and apologize profusely. Note that you can also select debuffs, and under the “Buffs gained” tabs, you can view uptime of buffs or debuffs that are cast on a player by someone or something else. For the sake of this discussion, though, we only care about Holy Pally CD casts. First, there’s a graph with pretty squiggly lines. The light yellow one shows damage the raid is doing (we don’t care about that at this time) and the orangish line shows damage taken by raid. If you’re colourblind, you can distinguish them (at least on this fight – and that’s why I picked this fight) because damage taken spikes at 6 specific spots. Those 6 specific spikes are Rampages. Under the pretty squiggly graph, there are green bars. Each green bar shows you when a buff was active. If you mouse over a green bar on World of Logs (note, this won’t work on my screenshots! 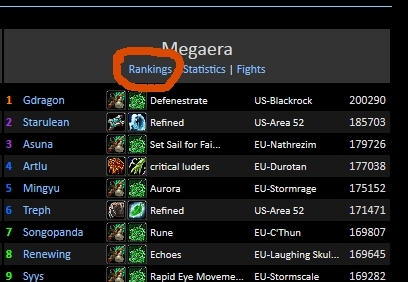 ), a tooltip will pop up showing who had that buff on them. Especially useful for assessing Eternal Flame usage, but also helpful if you happen to be interested in Beacon, Hand of Purity or Hand of Sacrifice targets. 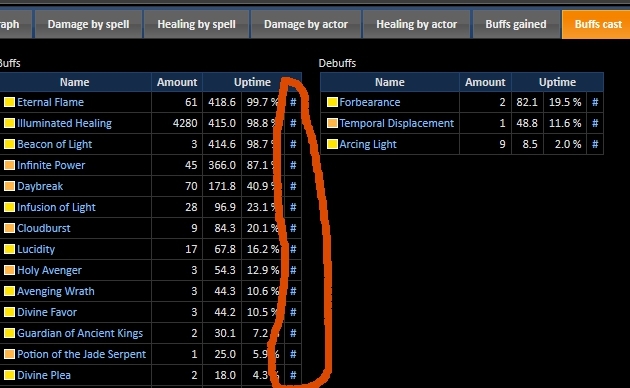 From this graph, we can see that our pro paladin has Eternal Flames running throughout the fight on a number of people (the brighter a green bar, the more people that buff is on). Rampage #3: Holy Avenger and Devo Aura. I added Divine Plea to the screenshot as well, you can see how it was used shortly before the third and fifth rampage. Now, when I’m writing Holy Pally beginner CD guides, I always say “Don’t use Divine Favor and Avenging Wrath at the same time, you just get more overheal and less time with an active throughput CD“. I stand by that. For 5s, most normal fights and periods of lowish damage, at least. When damage is periodically intense (such as this fight) and every ounce of healing will be useful, you might as well hit with everything you have. Plus, the earlier you use your CDs, the more likely they’ll be up at the end. For progression fights – whether you’re doing crazy heroic modes or you’re working on normal Horridon, you can plan your CD usage based on fight length and the time it takes for CD to come up. And then your “Buff Cast” graph can look like this one. I was going to end this post by adding a few more CD graphs of top Holy Paladins. Then I realized that I’d be wasting a precious exercise opportunity. So go, use the instructions here to find other examples of Holy Paladin CD planning! Hours and hours of fun, I assure you! 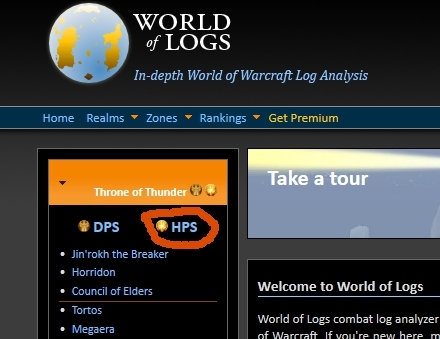 This entry was posted on June 16, 2013 at 5:01 pm and is filed under Paladinning Info, Teh paladin, World of Logs. You can subscribe via RSS 2.0 feed to this post's comments. World of Logs posts are great, even if they don’t walk through every detail. If nobody talked about it, nobody would know. I learned about WoL when a DK tank on EJ explained Heroic Lich King cooldown usage using WoL screen shots. Before then I knew about it, but didn’t get what was so great about it. So hopefully you are showing someone the light, since WoL is pretty much the best thing ever. Hehe, yeah, I love WoL. When I have the time, I prefer to use it to learn boss fights over strat guides or videos. I tend to get overenthusiastic when I write about it, though, and end up stretching the post in 10 directions, losing everyone in the process. Awww! Thank you very much! The poster has the option to hide the log as far as I’m aware, so if it’s supposed to be private then they should hide it. Going though WoL is great fun, except when I see how badly I play at times; then I get all depressed! I think there are privacy options, but still, I try to be polite! Confidentiality is a huge thing in my IRL line of work, so I get in the habit of worrying about it in everything I do. I get so depressed too when I do terrible. But that’s sort of what got me into logs. I got tired of being terrible so I learned how to compare what I was doing to what others were doing. Then I discovered it was fun. Now I’m a total WoL junky! I am just a random Boomkin that has enjoyed reading your blog over the years. Thanks for the WOL read. Usually the second thing I click on the site is the close button. 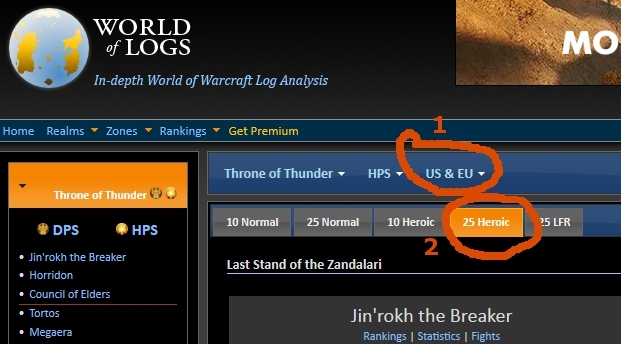 Do you happen to know how to check how many Holy Power Eternal Flames are people using in WoL? Unfortunately I don’t think there’s an easy way to tell. on how many Holy Powers do you suggest using Eternal Flame? I usually use 1 while Holy Avenger isn’t active, sometimes 3 on the tanks, and 3 while Holy Avenger is active (not that it gives you a choice!). The goal (for max HPS) is to have as many Eternal Flames going out as quickly as possible, but for functionality sake, you’d probably have to adapt based on damage patterns and healing assignments. This is a great post. It’s nice to see logs broken down so efficiently.